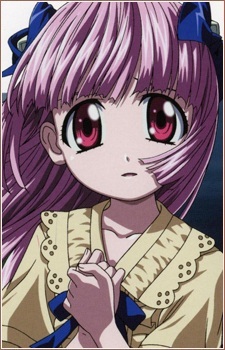 Also known as Number 35, she is a young girl described as the only surviving "third generation" Silpelit (a Silpelit born from one infected by another Silpelit, as opposed to one born from one infected by a Diclonius), and the daughter of Kurama at five years old. During an escape attempt by Number Three (who was actually Nana's sister), Kurama was infected by her vectors and thus turned into a carrier of the diclonius virus, and his daughter was born a silpelit. In the anime she possesses 33 vectors , each with an approximate range of 11 meters (the number and range is much higher in the manga). Mariko was imprisoned as an infant and raised inside a steel container with human contact consisting of nothing more than a scientist acting as a sort of foster mother through speakers and monitors. Her physical impairment is seen in her atrophied limbs as she moves around in a wheelchair. Despite the environment she was raised in, she is relatively well developed psychologically. She is extremely homicidal and sadistic, and enjoys torturing and dismembering her victims. However, her personality is not blatantly evil. She is only having fun, and the pleasure she gets from it is equivalent to a child playing with toys. In order to keep Mariko under control, the research institute implanted at least two bombs (probably more) in her body during infancy; one is used to remove her right arm after she attacks scientists at the institute. Kurama later orders the other bomb(s) to be detonated as he walks away embracing his daughter, killing not only Mariko, but himself as well.